St. Patrick’s Day is almost here and what’s a better way to celebrate than with festive treats! We have tons of St. Patrick’s Day candy and other festive candy to help you make delicious things. So what should you make this March feel a little lucky? Pretzel Pops: Kids will love these lollipops! All you need is pretzels, melting chocolate, lollipop sticks, and some candy to decorate the pops with. See how to make them on Mommy’s Bundle blog here. Mint M&M Cookies: Mint and chocolate is a match made in heaven. These brownie cookies are easy to make and are super delicious. Check out the recipe on Love to be in the Kitchen blog here. St. Pat’s Chex Mix: If you need to bring something that is sweet, salty, and easy to eat while watching your local parade, this is the recipe for you. This inspired Chex Mix can be made with M&M’s or with green Sixlets. Learn more on the Forever Your Prints blog here. Peek-A-Boo Cake: If you’re feeling extra lucky in the kitchen, you should try making this St. Patrick’s Day Cake. Inside is a rainbow shamrock inside with every piece. See how to make this cool cake on the Mom Loves Baking blog here. 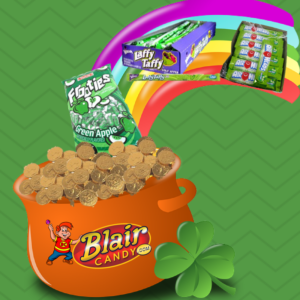 Get your St. Patrick’s Day candy today and share with us what you end up making! Visit us today at BlairCandy.com for all of your holiday candy needs.